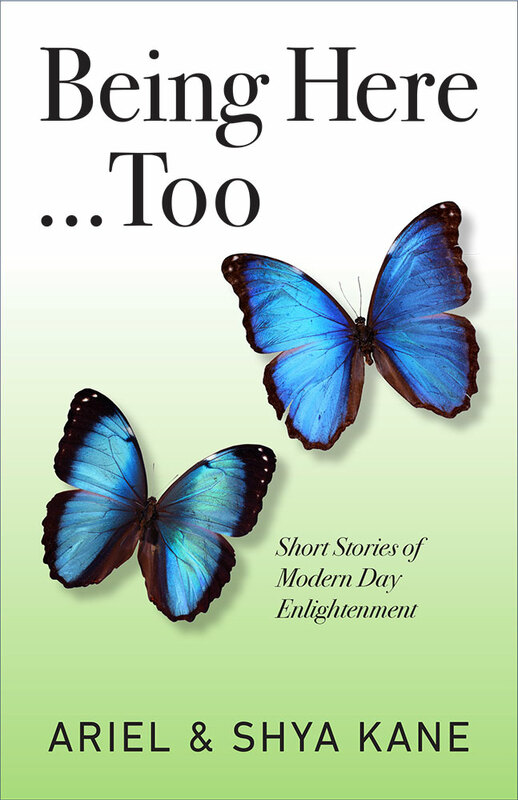 Being Here…Too is now available for pre-ordering on Kindle! Like all of the contributors in this book, I have experienced Instantaneous Transformation: a way of accessing a deep sense of well-being developed by seminar leaders and authors Ariel and Shya Kane. I like to call it the “lazy person’s way to enlightenment” because it’s so easy. I remember walking out of my first transformational seminar with the Kanes in 2006 and strolling up 8th Avenue in Manhattan. Everything seemed bright, clear, and three-dimensional in a way it never had before. It was so…quiet, even in the heart of New York City. I suddenly realized that for the first time in my life, my mind was quiet. I was simply experiencing what was around me, rather than listening to the incessant internal chatter that picked on me, picked on others, and worried. It was as if I had “shed a skin” during that course and found the person I truly was, hidden behind all that mind chatter. Before long, life got busy and I drifted away from attending seminars. I missed the Kanes, the transformational community, and the feelings I remembered from that post-seminar walk up 8th Avenue – but I told myself I didn’t need it anymore and could find it somewhere else. While I wasn’t particularly happy, I was productive and successful during that time. Although my relationship broke down, I moved up in my career from being a New York City public school teacher to an assistant principal, and then eventually I became the founding principal of my own public high school. One day, six years later, I was feeling stressed and tired and I realized that I wanted things to be easy again. When I searched on Google for the Kanes, I found they had a new book, How to Have A Match Made in Heaven. I ordered a copy and when it came, I took the book to Central Park, sat on the grass and started to read. Soon I felt a weight lifting off my shoulders, a weight I didn’t even know I’d been carrying. Their words brought me into the moment and I felt my mind get clear once again. I saw that I had been resisting all authority figures: my parents, my boss, other school principals, and even educational consultants that I had chosen and hired. It was so obvious, and yet I felt no remorse or regret. I just saw it as the truth, neither bad nor good. In fact, I was able to see the humor in it. Even though I was a high school principal, I was being as bratty and resistant as some of my students. Over the next several weeks, I continued to see more examples of how I was resisting the life I had chosen and was currently living. I subsequently shared my experience with the Kanes in an email. Then one evening, I gathered the courage to come back to one of their Monday Night Alive! seminars. My heart was pounding as the elevator doors opened in the New Yorker Hotel where the seminar was taking place. It was true. Ariel’s words opened up a space of non-judgment for me to realize that I had transformed. All it took was for me to see my behavior and it dissolved, no work or pain involved. From that day on, I became a full participant in the Kanes’ courses and their transformational community. Life has gotten simpler and far more fulfilling. I’m now in a loving relationship that is a true partnership. My job feels easy and satisfying. Whether I’m filling out paperwork, leading a meeting with teachers, organizing a fire drill, or coaching a student, each interaction becomes all-encompassing and satisfying, the only thing I want to be doing in that moment. Of course, unexpected situations arise that don’t fit into my “plan” of how my day should go. But I’m quickly able to recognize that what I have planned and what I prefer doesn’t matter. Taking care of what’s happening in the moment does. So I drop my preference and handle each unplanned situation as it arises as if it’s my idea. All it takes is Being Here and engaging in what’s actually happening rather than investing in a complaint that things aren’t going the way I want. The following chapters are written by ordinary people from all walks of life who are living extraordinary lives. Their stories are about discovering they are exactly where they want to be, whether it’s studying for an exam, going through childbirth, or being with a cousin on her deathbed. I invite you to immerse yourself in Being Here…Too. That’s enough to bring you into the current moment where you, too, can effortlessly access your own brilliance and experience the extraordinary nature of life. Being Here…Too will be released on Amazon on November 12, 2018, but it is now available for pre-ordering on Kindle. This book is full of real, everyday stories that will touch your heart and transform your life. When you are Being Here in the current moment…magic happens. Years of resentments dissolve, true love blossoms where it’s least expected, and ordinary moments become extraordinary. Award-winning authors Ariel and Shya Kane, along with folks from their international community, share inspiring true stories about life, death and everything in between. These heartwarming personal tales will allow you to enjoy the magic of Being Here…Too. Get additional information on this book here.